Sergio Perez says his Formula 1 deal with Force India is on course for a prompt renewal now that the team's future has been secured. Perez has been racing for Force India since 2014, but admitted earlier this year that his future with the outfit hinged on whether it would overcome its "critical" financial situation. 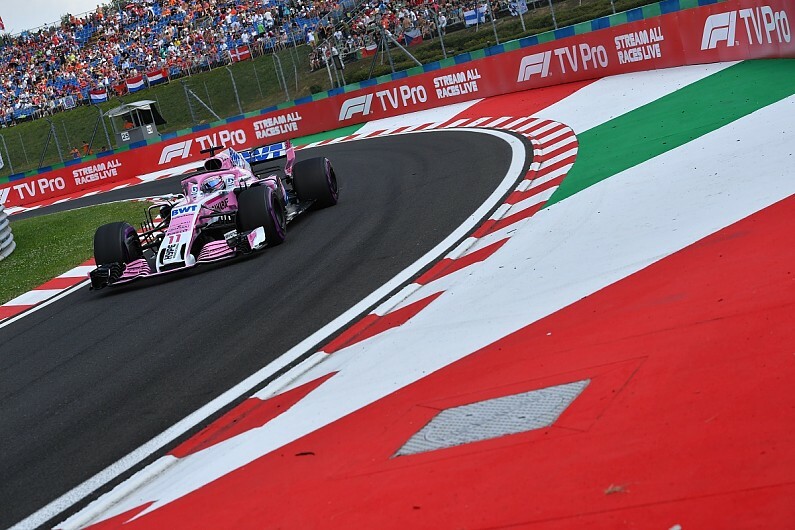 Now that the situation has been resolved due to the team being bought by a consortium led by Lawrence Stroll, Perez has said that he is close to extending his Force India stay. "I think it's a great opportunity to continue with the team," he told Latin American network Fox Sports. "When you don't have a chance at Ferrari or Mercedes, I think Force India is a very attractive option. "We are almost there [for 2019]. In fact, it's just a matter of days or weeks. It's just about clearing up the situation with the team. "My contract doesn't need signing. The renewal [option] is there and it's just about seeing what position the team is in to continue." Perez played a major role in Force India's recent takeover as it was his backers who took the legal action that sent the outfit into administration with the aim of protecting it from the threat of a winding-up order. The team's future was swiftly secured as the administrators accepted the Stroll-led bid. Stroll's son Lance, who has been driving for Williams since 2017, is now widely expected to make the switch to Force India for next year. "It was a very complicated situation, where I realised I was in a position I never expected as a driver and I had to act," Perez explained regarding the legal action. "There were 400 jobs at risk. "Fortunately everything has been rescued and everything looks great. "It looks like an incredible future for the team, with a good investment that above all gives the team a lot of stability, which is what it struggled with during the past years." A likely Stroll/Perez line-up at Force India would force the latter's current team-mate Esteban Ocon to look for a new team. The Frenchman's options for 2019 having seemingly dwindled despite his solid performances on track. Ocon, who was expected to move to Renault before the manufacturer's shock signing of Daniel Ricciardo, has recently been linked to the second McLaren seat alongside new recruit Carlos Sainz.